Make Possible is an online professional mentoring network with a face-to-face component. It was created as a SCWIST initiative funded by the Status of Women Canada to advance women in technology. 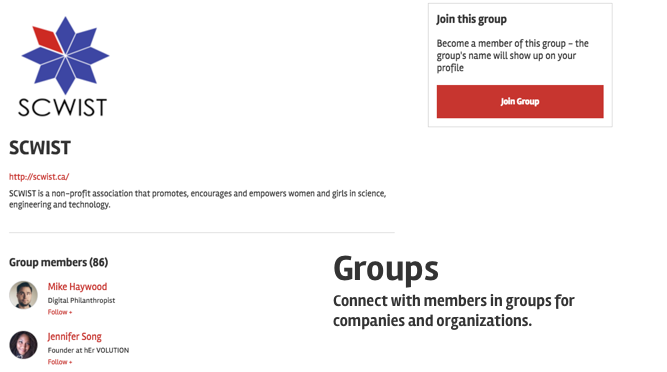 Its MISSION is to help women connect, collaborate and lead through a dedicated mentoring network in science, technology, engineering and mathematics (STEM). Its VISION is a world where aspiration, opportunity and diversity intersect. Make Possible is FREE to join. How does Make Possible integrate with LinkedIn? We make a one-time connection to LinkedIn to quickly pull your details into Make Possible during registration. After this one-time connection to LinkedIn, the information you provide resides in the Make Possible database and not in LinkedIn. 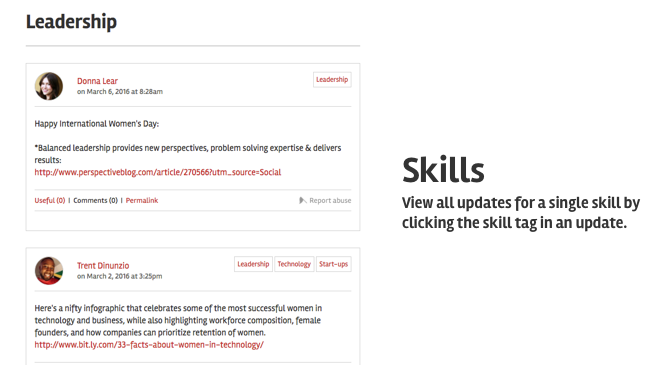 This allows us to create your profile and list of skills more efficiently. You can, however, create a profile without LinkedIn but you won’t be able to specify your professional history or education. How do I update my LinkedIn profile? If you’d like to update your LinkedIn profile, you can do that within the LinkedIn platform. Once you’ve changed your details in LinkedIn, you can automatically refresh your LinkedIn details in your Make Possible profile. Look out for “Refresh details” in the LinkedIn section of your Make Possible profile. How do I update my Make Possible profile? 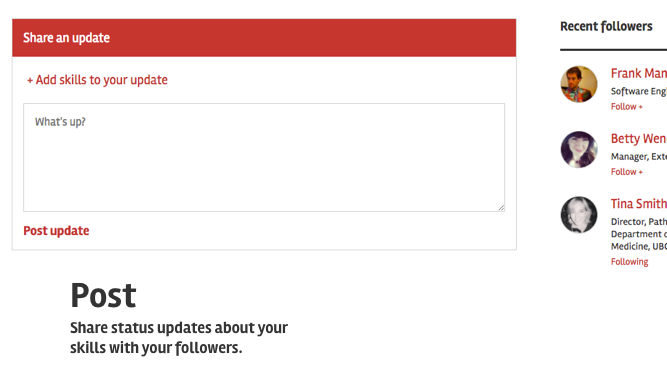 If you’d like to update your Make Possible profile, you can do that on your profile page. Simply find the area that you would like to update and select the edit function button to the right of your profile category that you wish to update. After you have made your changes, select "Update" and your changes will automatically be saved. 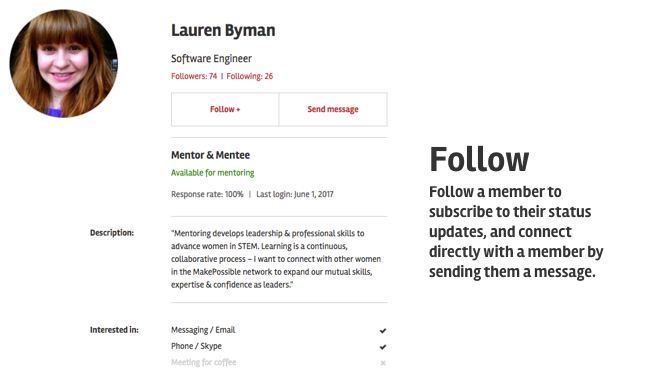 How do I search for mentoring connections? 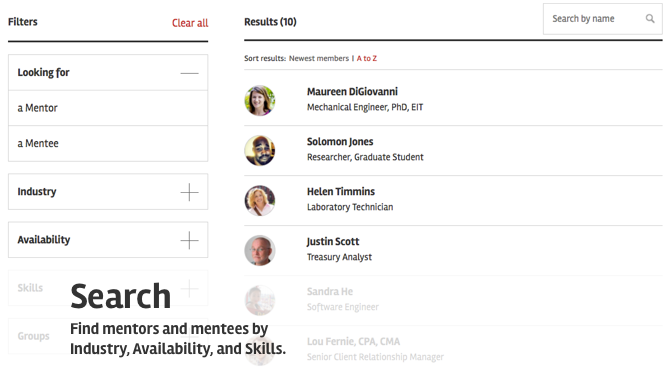 Make Possible allows you to browse the mentoring database and search for connections by industry type, skills and availability. You can also search by name. How can I can track my browsing and connections? The Make Possible dashboard shows your recent activity and mentoring connections, recently viewed Make Possible profiles and new members who have joined the Make Possible Mentoring Network. Your inbox shows all the connections and conversations you have had within the Make Possible network. What is the privacy setting and how do I change it? The Make Possible privacy setting determines who will be able to see your profile. You can either allow your profile only to be visible to other members within Make Possible or it can be visible to the public on the internet (ie your name, profile picture and description). You select one of these two options during registration but you can also change your setting in your account settings. How long does a mentoring relationship have to last? Your Make Possible mentoring relationship can last as long as you want or need. This relationship may start as a few informal connections over a short period of time or might evolve into a more formal, long-term mentoring relationship. It is up to you and your mentoring partner to decide what type of mentoring relationship works for both of you. How do I get together with my mentoring connection? You can arrange to get together with your connections in a number of ways. Your profile allows you to select your preferred ways - by phone, skype, coffee meeting or industry event. It is up to you and your connection to decide what option works best for you. If you want a more structured way to get together, SCWIST offers monthly opportunities to connect through their Brown Bag series, various Cafe Scientifique and other workshops. That’s understandable. For now, you can ensure nobody outside Make Possible sees your profile by making your profile private in your account settings. We’re working on enhanced privacy settings to ensure only the right people view your profile. Is the Make Possible mentoring network only for women? Make Possible is not just for women. Our mission is to help women connect, collaborate and lead through a dedicated mentoring network in STEM (science, technology, engineering and math). Men too, can be excellent connections and play a strong role in helping support and advance women in their careers. Everyone is welcome to join and help achieve the Make Possible vision - a world where aspiration, opportunity and diversity intersect. How can I provide feedback on my mentoring experience? You can provide feedback directly to your mentoring partners to sustain positive, effective connections. Coming soon - you both will be able to leave feedback on each other’s profile. If you deem the nature of your experience to be negative or not adhering to the Make Possible Terms and Conditions, please contact the Make Possible team immediately. Yes, please! Provide as much information on the bug and if possible, take a screenshot. Then, fill out the contact form or email us at contact@makepossible.ca. This will allow us to fix the bug and improve the functionality of Make Possible. I love this Make Possible mentoring network! How can I get more involved? We’d love to hear from you. Please get in touch through our contact form and tell us how you’d like to contribute to Make Possible. I would like to advertise on the Make Possible website. How does it work? We are working on building functionality around career opportunities for our members. If you’d like to advertise jobs on Make Possible, please get in touch and we’ll let you know how this aspect of Make Possible is developing. Can't find an answer to your question? Contact us for more information.